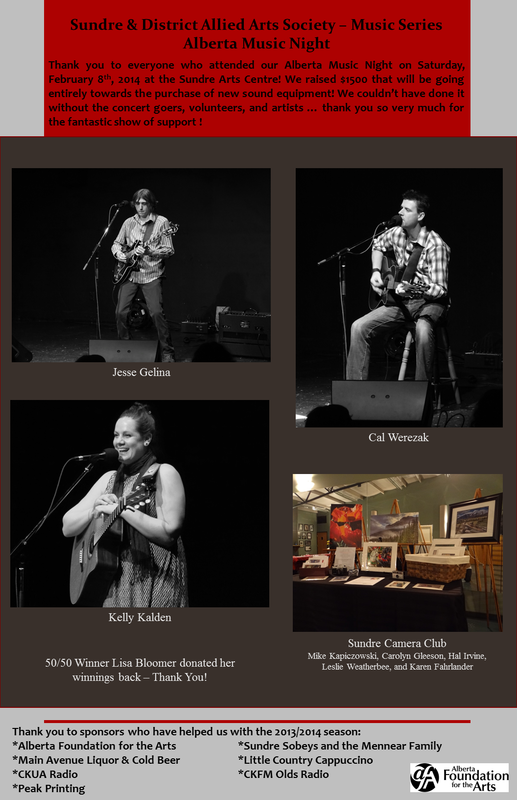 We couldn't do much at the Sundre Arts Centre without the incredible support of many businesses and organizations in Sundre and the surrounding area! We are lucky to have groups like these in the community who support the arts and non-profit organizations! 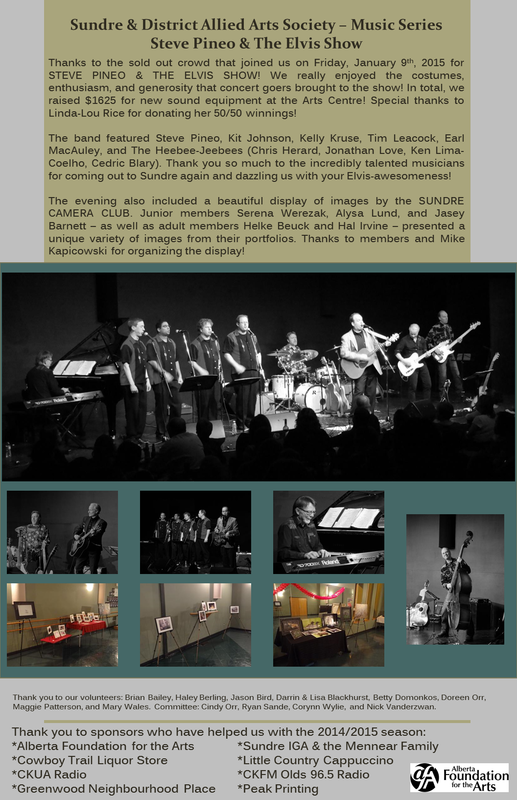 THANKS to STRINGS & KEYS for their very generous donation to the Sundre Arts Centre! Laurie and Jamie Syer founded Strings & Keys in 1995. Intended initially for their own students in the small rural community of Bergen, Strings & Keys grew to attract teachers and students from across North America. This year, their Board decided to bring the summer operations of Strings & Keys to a close, and to use the remaining resources of the Society to begin a new chapter in their support of music and music education for young people. Thank you to ALBERTA FOUNDATION FOR THE ARTS for awarding us an "Arts Presenting" grant for organizations! This helps us offset our previous year's Music Series artist fees! THANK YOU! THANK YOU to the Town of Sundre for awarding the Sundre & District Allied Arts Society a Recreation & Culture Grant! 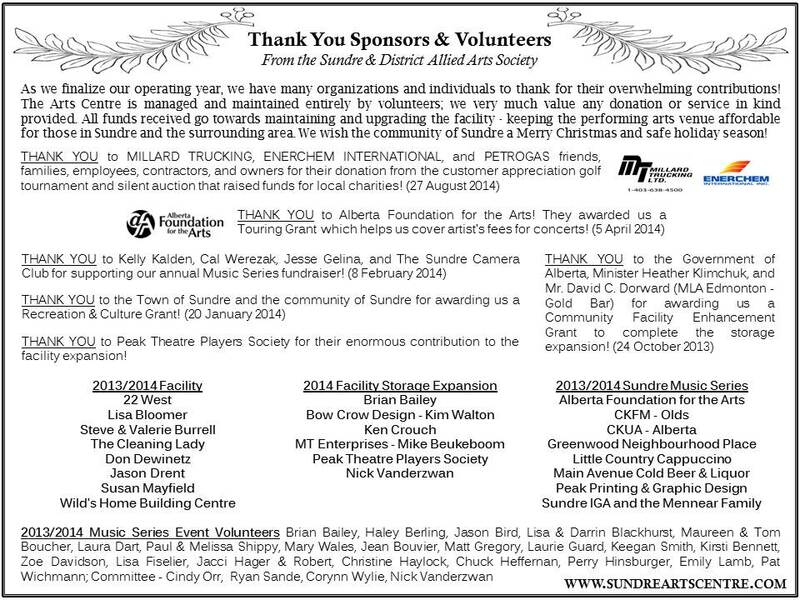 We are very appreciative and thank the Town Council & Administration - as well as the outstanding community of Sundre! THANK YOU to the Government of Alberta, Minister Heather Klimchuk, and Mr. David C. Dorward (MLA Edmonton - Gold Bar) for awarding the Sundre & District Allied Arts Society a Community Facility Enhancement Grant! We are very excited to complete the storage expansion of the Sundre Arts Centre! Thank you so much again!